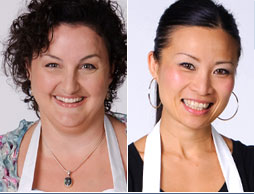 My Wey of Life: Who will be the 1st Masterchef Australia? Julie Goodwin or Poh Ling Yeow? Masterchef Australia is the 1st reality show in Australia that have the highest ranking and the first reality show that hasn't got anybody bitching around like stupid fools. They are very good role models. No cat-fights, No back stabbing. Just friendly match with good attitude and gaining experience from each other. I'm very excited about tonight's show and I can't wait to see what they are cooking tonight. p/s: Anybody try baking the Chocolate Mousse Cake yet? Difficulty is 10/10! If you are going to try to bake this Choc Mousse Cake, please let me know! !